This almond apple cake is worth it to try! It is a combination of a biscuit base (Muerbeteig) and a mix of apples, cinnamon and almonds. 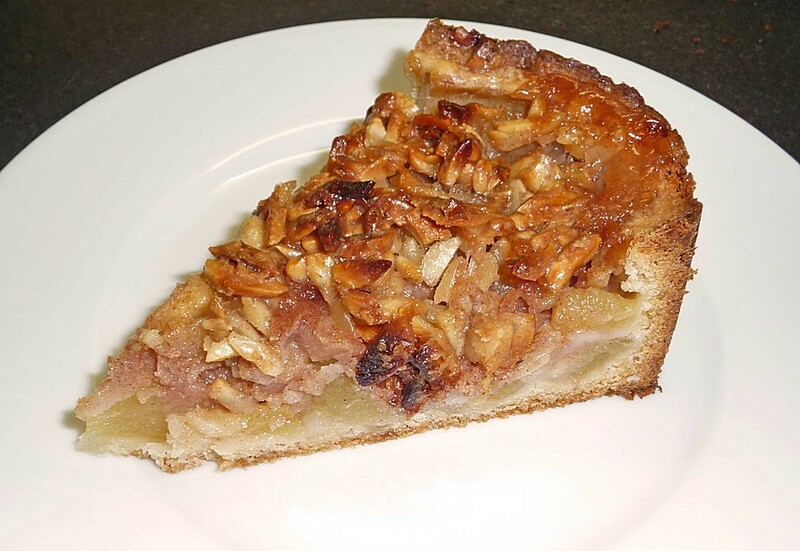 Of course all German apple cakes are great and just delicious but this one is special. Happy Baking! - Make the dough by mixing all ingredients for the dough. - Knead dough on a wooden board or smooth surface until it is smooth. Form to a ball, wrap in foil, keep for 30 min in fridge. - Peel apples, remove core and seeds. With a pointed knife cut each apple half several times but don't cut through the apple completely. - Grease a 28cm or 10 inches spring form with butter (bottom and edges), sprinkle with bread crumbs. - Place dough in form on bottom and around the edges of the form. - Put apples on the bottom. - Chop almonds or slice them. - Add butter, sugar, vanilla sugar and almonds in a pan, warm it a bit, mix well. - Combine with milk, cinnamon and flour, mix well. - Spread evenly over apples. - Bake in pre-heated oven on 390 F for 50-60 min, convection 375 F.